I have a laminitic, overweight 5 yr. old Arabian mare. Have her on sparse paddock 24 hrs/day. Feed her 1 cup oats with tablespoon of omega 3, 6, 9 soy oil and vitamin/mineral supplement twice/day. Also, hay for 30 minutes/twice per day. She has lost some weight but, seems to be gaining again. My question is…could I just stop feeding hay to her? I feed the oats as a vehicle for the oil and vitamin/mineral supplements. I am concerned about her emotional state if I were to keep her on a dry lot out of the paddock. I am in the process of building a track to reduce her access to forage but it is taking more time then I had hoped. Seems she is gaining weight on the little stubble in the paddock. It is early spring and warm but she isn’t shedding like her mom and has gone into early estrus…this concerns me also. Maybe early estrus is normal for some mares, I don’t know but the oil I give her probably has estrogen in it. Could the oil cause an imbalance? Thank you. I’m going to start with your most pressing question first, “could I just stop feeding hay to her?” Unfortunately, no. Long-stem forage should be the basis or foundation of every horse’s diet, and you should provide a minimum of 1% (preferably 2%) of her body weight each day in high quality roughage. This means weighing your horse AND weighing your hay, two things you should probably be doing anyway, given her health issues. Some options for safely feeding hay to the overweight horse are 1) to have your hay analyzed – especially for sugar and starch content – then soak if necessary to remove these simple carbohydrates and 2) to offer the hay in a small hole hay net or other device which slows down her rate of consumption. I would rather see her eating small amounts frequently than be restricted to only 30 minutes twice per day of hay. A grazing track works for some horses but if your mare is gaining weight just on the stubble in her “sparse” paddock, it may not be the best solution for her. Some owners of tremendously easy keepers have gone as far as to till up grass pastures and even paddocks with a hint of green so that their horses still receive turnout but no access to live plants. A second alternative is to use a grazing muzzle when she is turned out where there’s any grass. 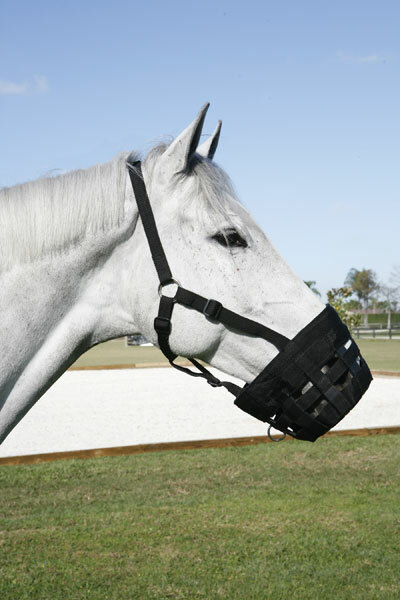 A few pony owners have even taped over the hole in the bottom of the muzzle so that their overweight equines don’t get ANY pasture. I like that you’re feeding a vitamin/mineral supplement but recommend you cut out all grains, including the one cup of oats. Many “multi-vitamins” come in pelleted versions that are tasty enough to be fed alone. However, omega 3 fatty acids are a nice addition to her diet for their support of cell and tissue health. Since you’re concerned about potential unintended effects from the oil, perhaps you could switch to flax seed, chia seed or fish oil so she still benefits from these healthy fats. I hope some of these ideas help you two get on the right track! I have read every article, post, blog and discussion about the easy-keeper and how to keep the weight off. Everyone has the same information and no real-life solutions. My 2 are on a low starch feed and they get 1/2 cup in the morning (because everyone is being fed), get turned out on darn near no grass at all during the day, come in to 1 cup fat balancer, multi-vitamin, pro-biotic, joint supplement and 2-3 flakes of stemmy grass hay with little value but high roughage. Ridden 4 times a week or so. OBESE!!!! I have the same problem with a 13 yr old mare, she doesnt get much pasture..stubble-no grain and is BIG.She is even grouchy and unwilling during riding and she wasnt like this before,,I wish there was an easy solution! !Do you notice an attitude with yours too? I just went through this with my 11 year old Haflinger Arab, doing exactly what the article says. I pulled my horse off of pasture and kept him in the paddock on dirt eating only hay -2% of his body weight. I tried giving him a pelleted Laminitis supplement but he didn’t like the taste. It took about 2.5 months for him to lose 250lbs. He’s now at a healthy weight, happy, and not ouchy. We also brought in small washed brook stone for him to stand on. It has really helped speed his healing time – improving circulation within the hoof. He was also more willing to walk on it than bare ground. We disregarded our farrier’s warnings for about two years until we had a serious problem on our hands. As soon as we took his advice, taking him off pasture and limiting his feed we started seeing improvement. We’re now ready to let him out into the pasture for limited periods of time with a grazing muzzle. Talk to your vets about levothyroxine sodium (thyro-L) and testing thyroid levels. I had one gelding that continued to be huge despite only 1 flake twice a day (well under 1% of his body weight unfortunately). His thyroid fiction came back “low normal” and we started him on 3 scoops of thyro-l. He dropped over 100lbs in the next two months. That was 6 years ago. Today he is on 4 scoops daily, plus gets 2-3 flakes of alfalfa twice a day, senior and ricebran. He looks great and is healthier and sounder than when he was 5 (10 years ago). Not to mention how happy he is to be fed like everyone else! !